Sometimes a girl just wants a good beach read, ya know? So where do you turn? To one of the undisputed queens – Dorothea Benton Frank. And not just because many of her books take place at the beach. But rather because they are full of interesting characters and diverting plots. Same Beach Next Year is just such a tale. I thank TLC Book Tours for sending me a copy at no charge for my honest review. This was a tale of two couples who end up being life long friends but not without some complications along the way. Adam and Eliza have twin boys and vacation each year on the Isle of Palms. One year as Adam is swimming he comes out of the water and finds Eve, his high school sweetheart. Yes, Adam and Eve. Seeing her Adam is reminded of his youth and all that could have been. He impulsively invites Eve and her husband Carl to join he and his wife that night – Eliza is not sure about this as Eve is (of course) stunningly beautiful. The two couples end up meeting every year at the condo building – after a rough second year – and are joined by Eve’s obnoxious mother and Adam’s father. The years pass, the children grow up and Adam still sees Eve as some kind of ideal. Life goes on, the children go off to college and still almost every year the families meet up at the beach. Adam is a man that looks at Eve and sees his past. He also is quite wrapped up in himself. This attitude almost costs him all he holds dear. Eliza buried herself in her marriage and family and practically lost all that she was. Eve just lost herself in a bottle and I am not sure Carl ever knew who he was other than a doctor. It takes two big crises for these couples to find themselves and the strength in their marriages and their friendships. This was a book full of rich characters and a satisfying series of plot lines. I have to admit to not liking Adam much – but I suppose that was to be expected. All of the characters barring the children of the two main couples are well rounded and defined. Perhaps these children will be starring in their own books in the Dorothea Benton Frank canon. 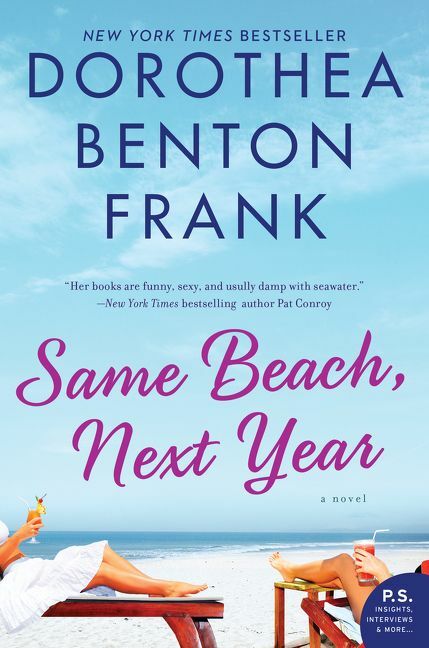 Same Beach Next Year was a welcome diversion for me from the heavier, darker books I had been reading.